Taylor's Reading Corners are a gift from Taylor to us all. Books opened the world to Taylor and helped her imagine her dreams. She then had the courage and energy to live them. Reading inspired Taylor to live her dreams and it is possible, if you decide for it to be, that these books will help inspire you to find and live your dreams. That would make Taylor happy. On March 11, 2011, the coastal regions of northern Japan were devastated by an enormous earthquake and terrible tsunami. Countless lives were lost, homes were washed away, and even today many are still missing. Ishinomaki City in Miyagi Prefecture was severely damaged. 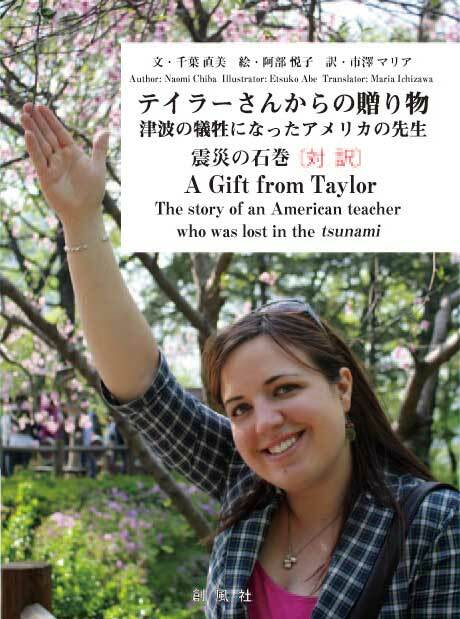 Taylor Anderson, a young woman from America, also became a tsunami victim at the age of 24. Taylor was from the state of Virginia. After graduating from college in 2008, she became an assistant English language teacher at the Ishinomaki elementary and middle schools. Taylor loved books. Her family, wanting to help the children affected by the disaster, sent books to the schools where Taylor used to teach. This started "Taylor's Reading Corner." The bookshelves were made by woodworker Shinichi Endo . Mr. Endo also lost his three children in the earthquake and tsunami. Two of those children were Taylor's former students. The bookshelves are full of Taylor's love for Japan, her second home. This, along with her love for her students, and her love of Jbooks, serves as a bridge linking Japan and America. Taylor's Reading Corner will continue to encourage children to love reading, expand imaginations, foster dreams, and help children spread their wings to fly out into the world. International orders it's easy to order! If you want to order this book abroad, you can use NIPPAN IPS order system. Please download the order form and FAX it to NIPPAN IPS CO., LTD. If you have any questions, please contact "info@nippan-ips.co.jp"